Aircraft of Germany in WWII. 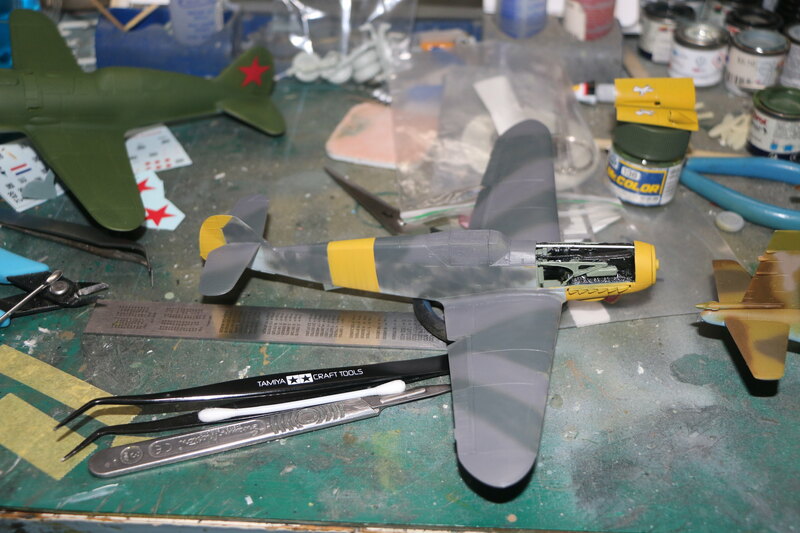 Well I've been busy working on several projects including the Bf109 project for the Stalingrad campaign over on Amorama. 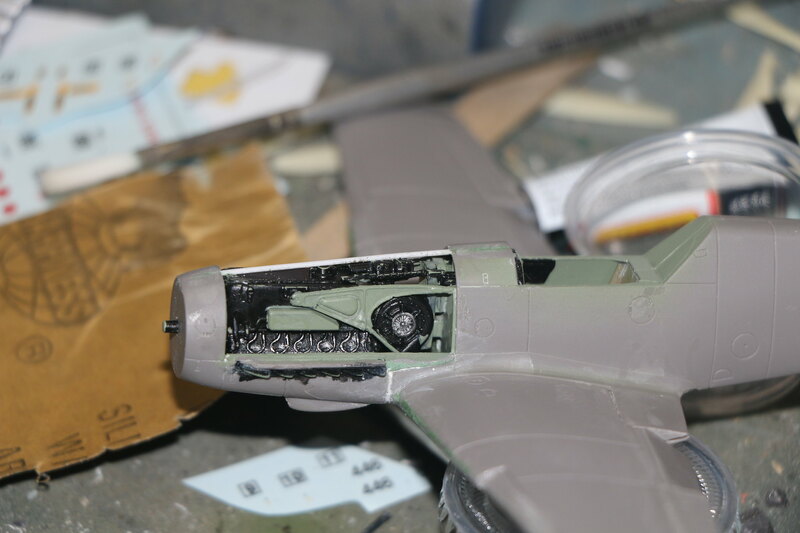 The first issue I struck with the build was with the cannon housing, the engine bulkhead and the floor of the cockpit. The bulkhead cut outs for the floor are wayyyyyyy to small and need to be expanded, a sharp scalpel made relatively easy work of it. Once assmbled I found there was no way the cannon housing would fit flush against the bulkhead and the floor. I needed to sand the bottom of the canon housing down till I achieved a good fit and the housing for the barrel to the rear of the DB601 was square to the engine AND the bulkhead. The fuselage can be assembled and the cockpit slid into place from underneath. The fuselage was a little warped and needed careful gluing a section at a time with the glued section being held together with masking tape. There are no locating pins anywhere in this kit! I've also found the instructions to be a little unclear as to where certain parts needed to go and I ended up putting the supercharger in entirely the wrong place. I found this out when I tried to attach the engine mounts and the one on the blower side wouldn't fit. Fortunately the plastic is soft and easy to work with so I manged to pry it apart and glue it in the correct place. Once there it became obvious where it needed to go. 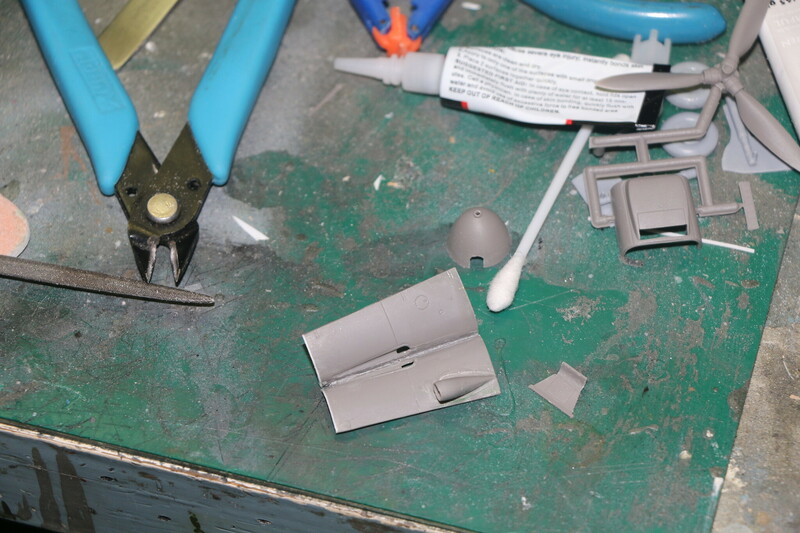 I've found the ICM kit to be tricky with the nose of the 109 being made up of several assemblies. This means there is a need for careful alignment. 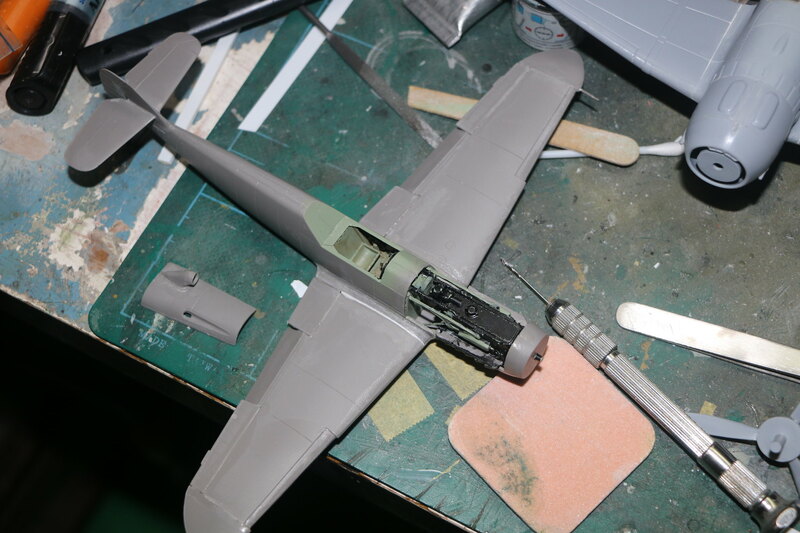 I thought I was doing great till I assembled the wings and the fuselage and found the oil cooler under the nose (another assembly) twisted to the left. Which made things a tad tricky to correct as I'd assembled it all together including the engine and mated it to the rear of the fuselage. 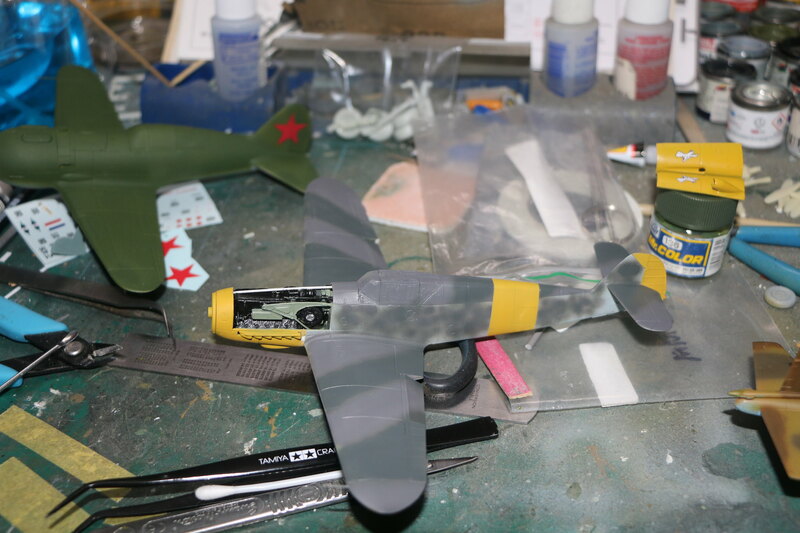 When I build the next one (I have a Bf109F-4 to build) I'll follow the instructions and mate the wings to the fuselage first before assembling the nose around the engine. To fix the issue I used a fine razor saw to cut the oil cooler away from the fuselage and realign it correctly. I inserted a fine piece of plastic strip to fill the cut left by the saw and help with gluing it all back together. The strip can be easily seen in the following pics as it's stark white. 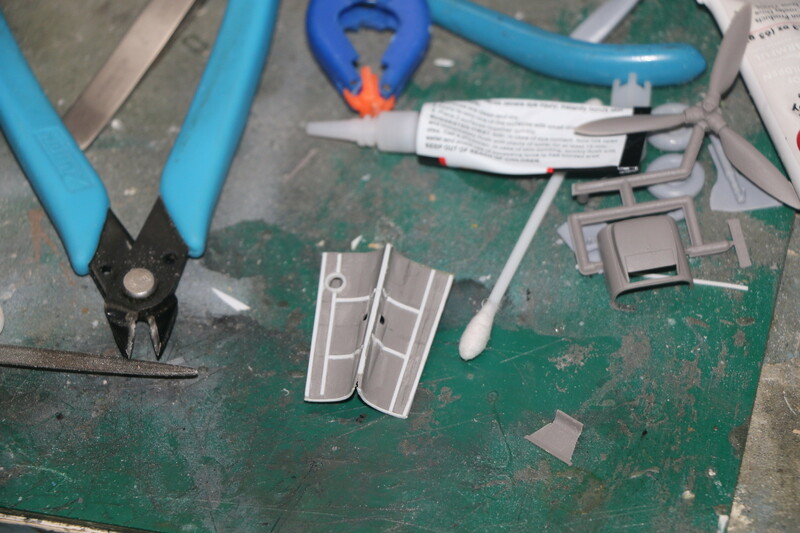 The right side wing to fuselage fit isn't good and needed more plastic strip ti fill it in. 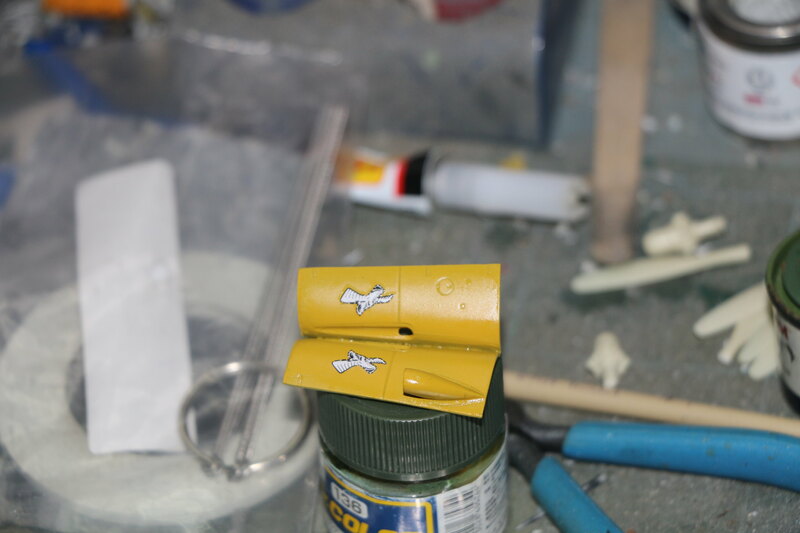 Only 1mm thick so not hugely out but fitting the wings when the instructions say to may have helped witht this also. This may make the kit sound like a lot of work but not really most of this was simply correcting errors that had crept in by my own hand. I've thoroughly enjoyed building this kit and figuring out how best to build it. 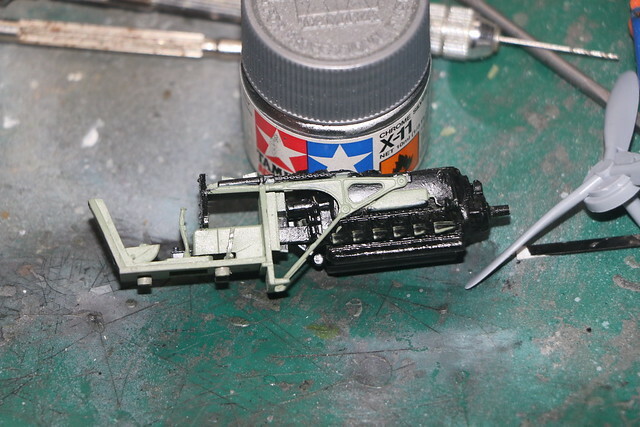 I've got the interior painted and I'm working on displaying the cowls open to avoid having to close up the engine. Which I can do, just not easily as it seems I need an extra pair of hands to get everything aligned. So I've been studying everybody else's build and I came to realise something that most had displayed the cowls open by simply gluing the panel open. 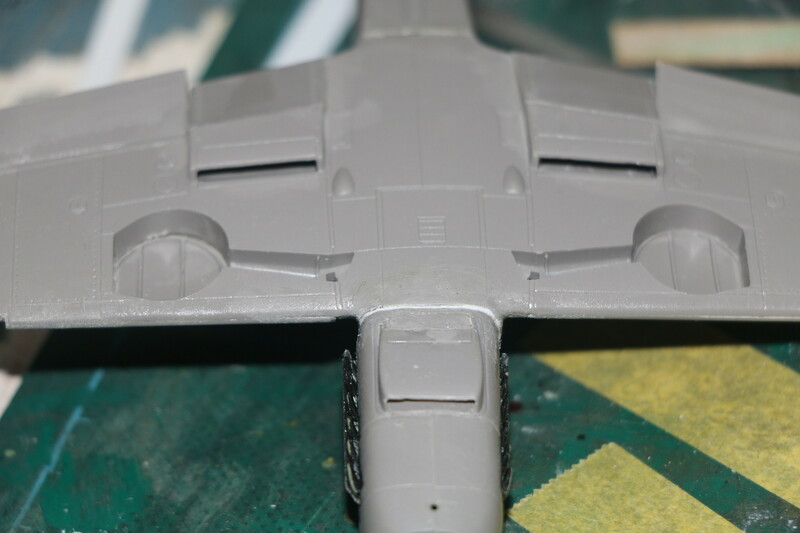 However looking at pics online of the actual engine cowls it became clear that they needed to separated along the panel lines not simply just stuck in the open position. 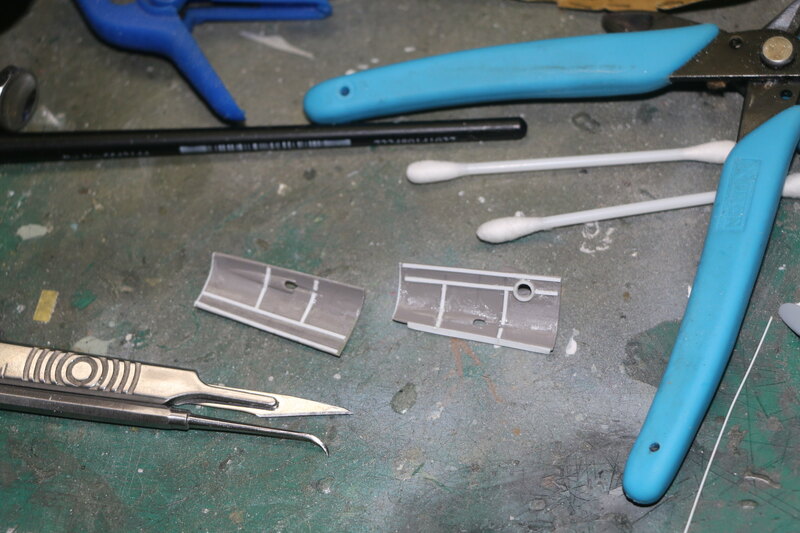 So I carefully scribed most of my way through the panel line and as the plastic is soft cut it the rest of the way through with a fresh scalpel blade. Also there is a support that runs down the nose to the spinner so the cowls can actually open which is not provided in the kit so I built one. There is no hole in the cowl under the air intake so I carefully drilled out the area and applied some circular plastic tube to simulate the joiner between the cowl and supercharger. I also roughly applied some bracing to the isnside of the cowls to get a close approximation of the real thing. I then joined both halves together and set them to oneside for painting. I glued a piece of plastic strip to one side to help when gluing both halves together. 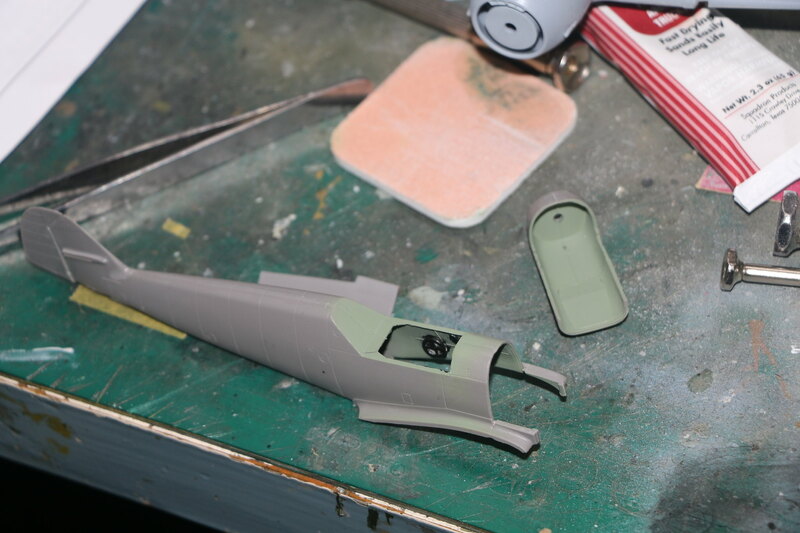 So after a little more assembly and some serious masking efforts we find ourselves at this point. 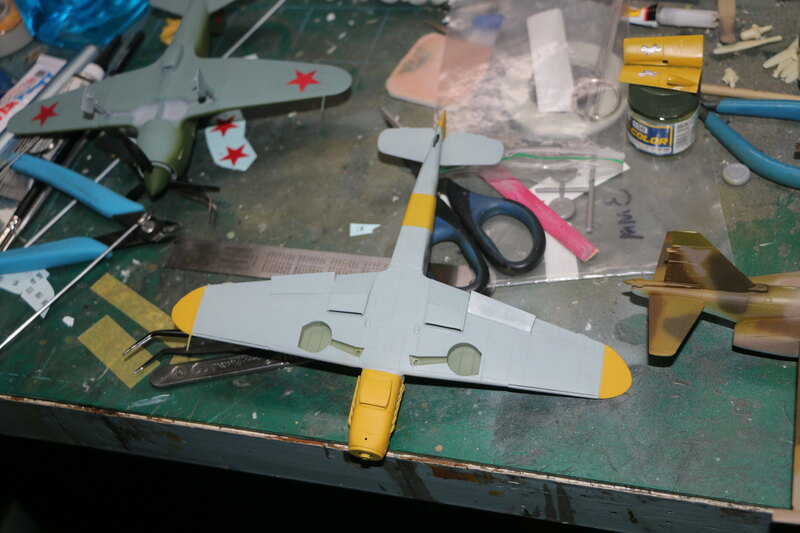 Time to add some decals and then a modicum of weathering. I've still go to figure out what I'm going to use as cowling supports but it is going to be thin brass tube just not sure which size will look more to scale. There were some fit issues but at times they were of my own making. The surface detail is quite good and reasonably consistent across the model. I had trouble with the radiator flaps and decided to simply close them up. I drooped the flaps although I'm uncertain if they did so on their own, but it adds something more to the look of the aircraft. Any who here are the pics enjoy! Hi Jess I did wonder not much that can be done now. I'll have to do some more research and apply it to the F4 I'll be building in the future. Maybe the ground crew wired them up while they investigated whatever it is they have the lid open for? Always a possibility which would require some research into exactly "how" they were held in the closed position. Awesome idea Jessie, my thanks, time to change my focus on the build and turn it into a diorama. Now where did I put my Luftwaffe erks (Schwarzen manner for those Luftwaffe types)? The F4 is on the Eastern Front in Winter so the pilot might have the radiator flaps in the closed position to warm up the fluids quicker on start up. Or to keep them warm longer after landing.